One of two green “arms” that reach into the San Diego Bay and wrap around the Embarcadero Marina. The entrance to the marina divides the parks. A nice walkway extends along the shore, connecting the two parks. On the bay­side of the Convention Center, this park with its sweeping open lawn is a popular site for outdoor concerts. 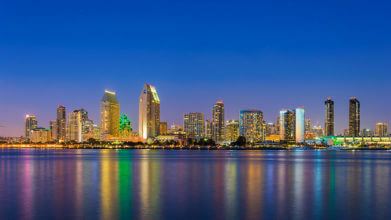 It has been home to the Symphony Summer Pops, a variety of pop­rock concerts and the San Diego Blues Festival ­ as well as San Diego a la Carte, a festival of restaurants. This is a great place to fly a kite, when the wind is right. There’s a popular fishing pier here, too.